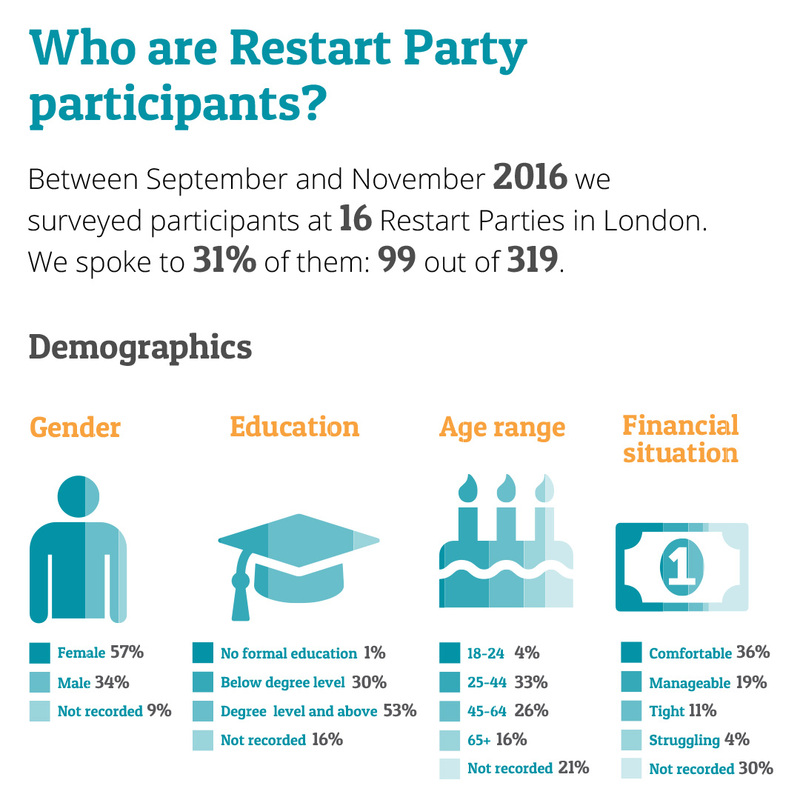 In autumn 2016 we worked with Nottingham Trent University to find out more about Restart Parties participants. We wanted to learn about their views and attitudes towards repair; their motivation for attending our events; their repair skills and confidence; their recycling habits, and their experience at the events. NTU researchers Christine Cole and Alex Gnanapragasam, helped us develop our survey questions, then analysed the data and wrote the final report. While we only interviewed 99 people, the findings provide us with very helpful initial insights into participants’ expectations and experience at a Restart Party. We hope they will inspire further research to better understand the community repair ecosystem. Many people (45%) cannot name a commercial repairer that they trust. The lack of knowledge of existing repair ventures and lack of trust in commercial repairers is a key issue to address. Very few respondents were “extremely” confident in undertaking repairs at home (8%), many more were “somewhat” or “moderately” confident (33%) and 48% were only “slightly” or “not at all” confident. Many of the respondents reported that they have previously attempted some kind of repairs at home (56%). However, they report varying levels of success with previous repairs and cite knowledge, skills and confidence as major barriers to further attempts at repair. It is these very barriers that The Restart Project addresses. 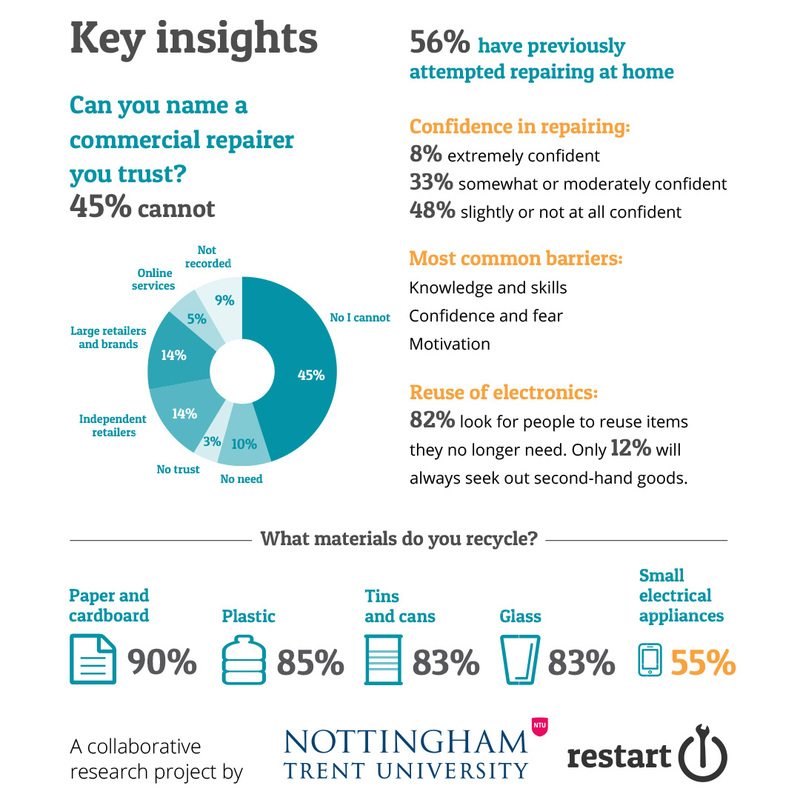 Respondents report that they are avid seekers of reuse options for their products when they no longer require them, with 82% reporting they looked for people to reuse items they no longer had a use for. Small electrical and electronic items were not recycled by as many of the respondents as other types of household items. The Restart Project appears to have a role to play as ‘environmental educator’ in inspiring additional recycling within the community. Throughout the research, participants said they particularly valued the social aspect of the Restart Parties. Feedback shows that there are high satisfaction levels with the events, even when repairs to the objects participants have brought along have been unsuccessful. Working in a social environment, meeting others with shared interests and learning or passing on repair skills in this way appears to offer considerable potential to empower communities to attempt repairs and thereby extend the lifetime of products. We plan to continue working in this area, starting with a follow-up survey with participants to this research, to learn more about the long lasting impact of participating at a Restart Party, so watch this space. Researcher Alex Gnanapragasam focuses on sustainable consumption and product lifetimes – we talked about what consumers say they want and what they do. We perceive things don’t last – so how can we help people keep things for longer?